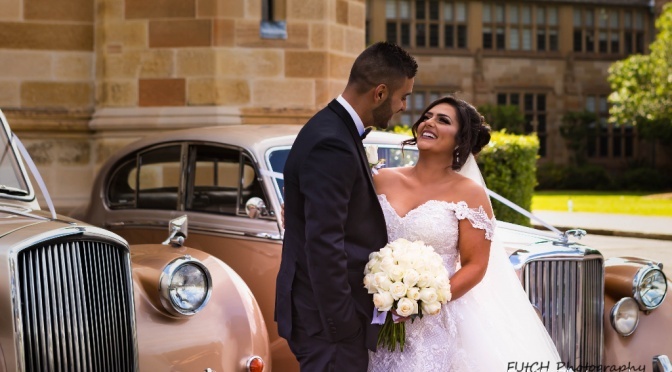 When you are looking for the right classic car in sydney for your special day there is lots to consider! What is the theme of your wedding? Will the bridesmaid dresses clash? Will the colours suit your venue? We’ve noticed trends come and go as seasons change. At the moment, Gold & Champagne is definitely the most sought after but White will always remain a classic choice. Lots of brides forget that ultimately the day is about her and her groom and a white dress really stands out against a beautiful coloured classic car. Photographers love when we have our Two Tone Silver Rolls Royces out on a job, it makes for the perfect backdrop in your wedding photos against a white dress. But not all classic cars look good in any colour. We spent lots of time finding the perfect shades for each car. Some cars look beautiful in certain colours, others not so much! Thats why we think we have the perfect set of classic cars. Not too many as we want to be able to maintain the ones we have and keep them looking and running immaculately but just enough to cover all the beautiful and classic colours that make the perfect addition to your wedding day!